Union troops travel through southeastern Ohio in hopes of catching up with Morgan and his Raiders. 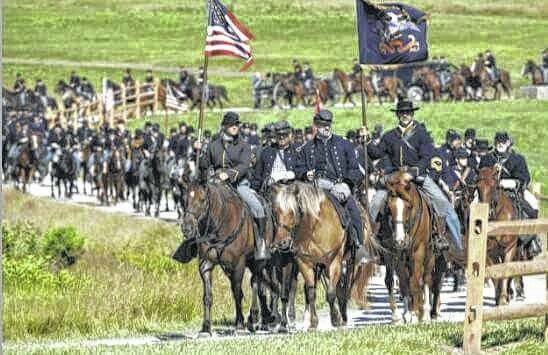 PORTLAND — Ohio Department Sons of Union Veterans of the Civil War will be hosting the Buffington Island Battlefield Memorial Service, July 21, at 11 a.m. at the Buffington Island Battlefield Park to remember the 155th anniversary of what has been called the only major American Civil War battle in Ohio’s history. According to an Ohio History Connection program provided by James Oiler, commander of Cadot-Blessing Camp 126 with the Sons of Union Veterans of the Civil War, on July 19, 1863, the Battle of Buffington Island commenced and was recognized as an engagement during “Morgan’s Great Raid” into Indiana, Ohio and Kentucky. General John Hunt Morgan led roughly 1,800 Confederate cavalrymen against 3,000 Union artillery, cavalry and infantry, which were supported by gunboats on the Ohio River. The encounter lasted two hours, reportedly. Morgan’s Confederate forces were to cross the Buffington Island ford before meeting with and being defeated by Union resistance. A third of Morgan’s command was considered captured and his forces “scatted to the north.” Morgan was captured July 26 in Columbiana County. The battle reportedly also included Rutherford Hayes and William McKinley, two future Ohio presidents with Ohio ties. Associated with the program are musician Steve Free and reenactor William Donegan.